During the rabid years of the Satanic Panic, circa 1983, they started removing books from the Byron High School library, then eventually cracked down on anyone playing Dungeons and Dragons on school property or reading "objectionable" books on school grounds. All weekend I've been trying to recreate in my memory a list of a few of those books. Then I did what I always do: I went to Ebay and Abe Books and started buying those books for my library. Surprisingly, after that episode in my teen years I never read sci fi or fantasy at all, but for the past year I've been playing Dungeons and Dragons on Tuesday nights and my interest has been rekindled. Before I list the books I must relate another memory that puts it in a little more perspective for me. At that time we got a young librarian from NIU who was young enough to notice a bunch of us were hanging out during lunch and playing D and D instead of shooting baskets or outside smoking. He asked us what types of books we were interested in the library acquiring, and he got requests from a lot of us. We were overjoyed, and started checking the books out. Others were apparently not overjoyed, and a few weeks into the books arriving they were pulled from the library shelves and never returned. Then we were banned from playing Dungeons and Dragons on school grounds, and eventually many of us bought the books on our own but soon found out they were banned on school property, also. 2) Mazes and Monsters. 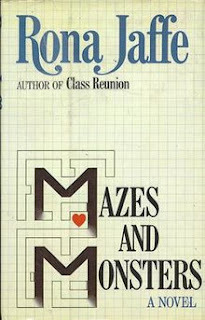 Rona Jaffe. I learned a new term today. Problem novel. The social novel, also known as the social problem (or social protest) novel, is a "work of fiction in which a prevailing social problem, such as gender, race, or class prejudice, is dramatized through its effect on the characters of a novel". For some reason AIDS wasn't considered a problem during the Reagan administration, but role playing games and fantasy novels were. We came back for the Spring semester, and the young librarian was no longer there. For the first time there were now electronic chutes at the door which monitored the egress of books with a chip. Whereas before the congregating of a few nerds in tha back room was of no interest to anyone, our gathering was now scrutinized closely. What I can tell you about that group of kids is that one of them became a high-ranking Marine officer, more than one, and even more than two made a lot of money in Silicon Valley, and the one who came closest to freaking out and becoming like a character in one of these "problem books" now lives on one of the most hum drum and Pleasantville roads in this town. That would be me. And I'm still contemplating flipping out and just entering a fantasy game one evening and not returning at nearly 50. Here's a few of the other books I have already ordered or will still be ordering. 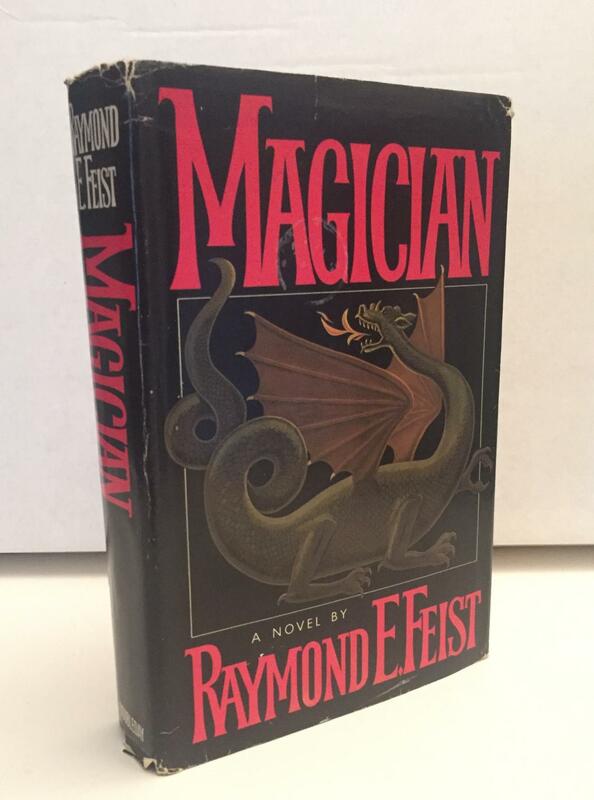 3) Magician. 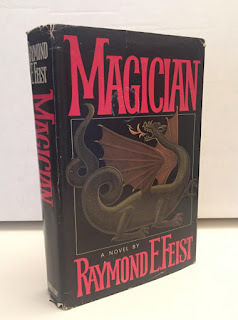 Raymond Feist. At Crydee, Pug, an orphan boy is apprenticed to a master magician. Suddenly the Kingdom is aswarm with alien invaders, destroying the peace of the kingdom. Pug and his friend Tomas are swept up into the conflict, with Pug's destiny leading him through a rift to a new world. That sounds vaguely familiar to me, but I'm not sure if I finished this one. Just ordered it from Abe Books. Saw copies selling for several hundred dollars, but I settled on a more economical book club version. Here are a few of the others I remember. 4) The Mists of Avalon. 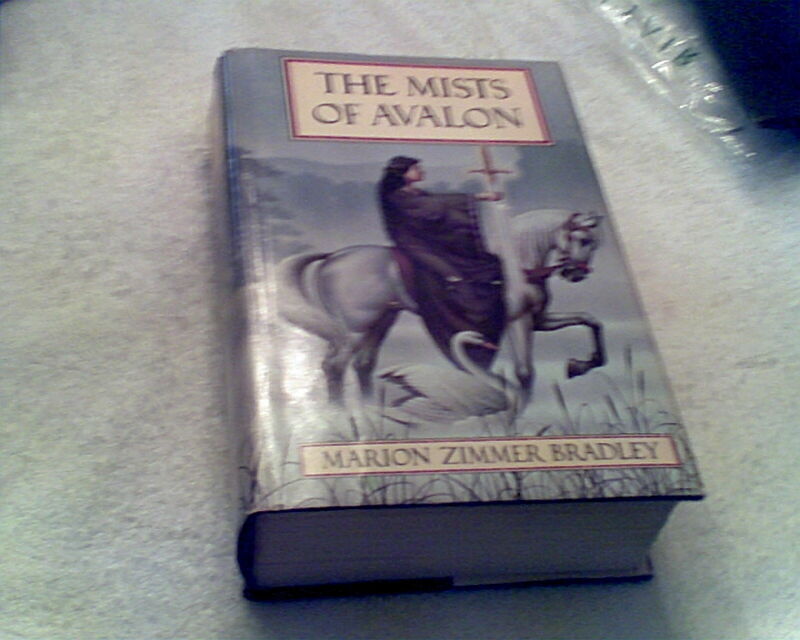 Marion Zimmer Bradley. In this one the Camelot and King Arthur legend is told from the perspective of the female characters. Morgan la Fey is less of an evil witch bent on destroying the Knights of the Round Table than a druid priestess trying to save her pagan religion from zealous Christian barbarians. I wonder why they didn't like this one. 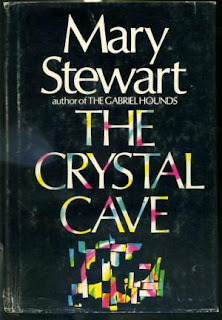 5) The Crystal Cave. Mary Stewart. In this one, written before the ohers, I think in 1979, the Arturian legend is told throuh the eyes of Merlin. This is the first of a trilogy, and is about his adolescent years and travels as he comes into his own as the sorcerer and prophet he is. This isn't my copy. I haven't bought it yet. 6) Sanctuary. 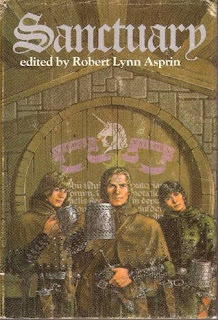 Edited by Robert Lynn Asprin. 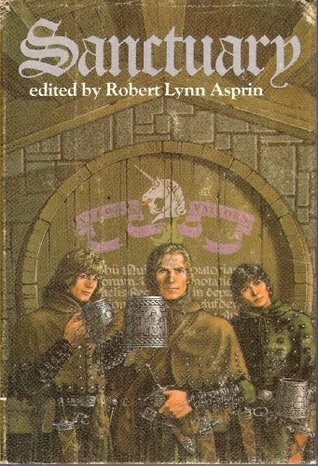 22 stories of heroic fantasy including: The Gate of the Flying Knives, by Poul Anderson; Blood Brothers; by Joe Haldeman; Looking for Satan, by Vonda N. McIntyre; The Secret of the Blue Star, by Marion Zimmer Bradley; Myrtis, by Christine DeWees; The Price of Doing Business, by Robert Asprin; Shadowspawn, by Andrew J. Offutt; Shadow's Pawn, by Andrew J. Offutt; The Face of Chaos, by Lynn Abbey; Sentences of Death, by John Brunner; To Guard the Guardians, by Robert Asprin; Vashanka's Minion, by Janet Morris; The Dream of the Sorceress, by A. E. van Vogt; The Fruit of Enlibar, by Lynn Abbey; Goddess, by David Drake; Spiders of the Purple Mage, by Philip José Farmer; A Man and His God, by Janet Morris; Then Azyuna Danced, by Lynn Abbey; The Rhinoceros and the Unicorn, by Diana L. Paxson; The Vivisectionist, by Andrew J. Offutt; A Gift in Parting, by Robert Asprin; Ischade, by C. J. Cherryh. Also includes maps of Thieves' World, introductions, and essays. This one I'm looking forward to getting and reading. Maybe again. 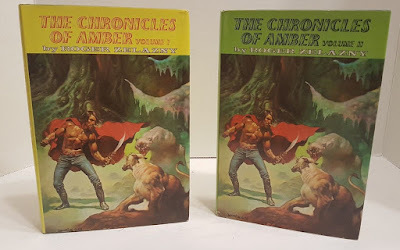 7) The Chronicles of Amber. Roger Zelazny. 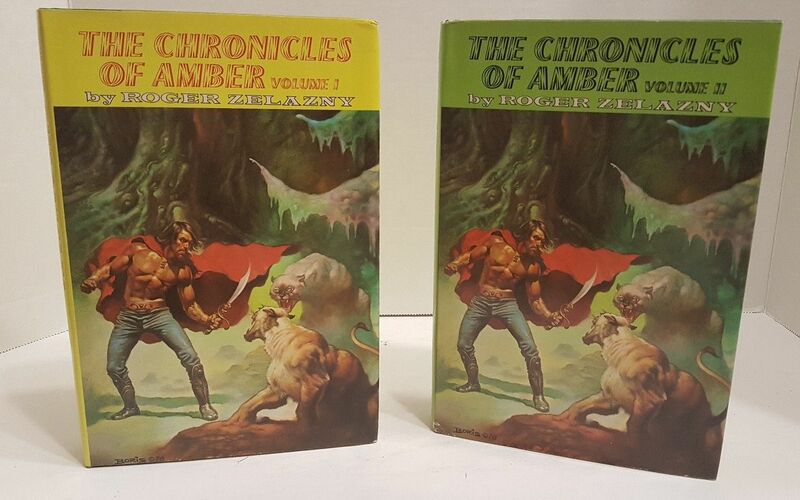 The Chronicles of Amber is a series of fantasy novels by American writer Roger Zelazny. The main series consists of two story arcs, each five novels in length. Additionally, there are a number of Amber short stories and other works. The Amber stories take place in two contrasting "true" worlds, Amber and Chaos, and in shadow worlds (Shadows) that lie between the two. These shadows, including our Earth, are parallel worlds that exist in, and were created from, the tension between opposing magical forces of Amber and Chaos. The Courts of Chaos are situated at the very edge of an Abyss. Members of the royal family of Amber, after walking a Pattern that is central to Amber, can travel freely through the Shadows. 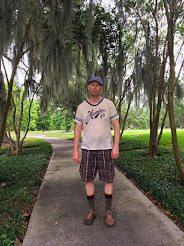 While traveling (shifting) between Shadows, one can alter reality or create a new reality by choosing which elements of which Shadows to keep or add, and which to subtract. Nobles of the Courts of Chaos who have traversed the Logrus are similarly able to travel through Shadow. When I talked about this to one of my Planescape buddies, also a child of the 80's, he told me about the Streisand Effect, whereby when you try to erase something from the memory of others it just creates the opposite phenomenon, and the thing becomes even more powerful. This is a list of books I may very well have read, enjoyed, and not remembered very much at all if there hadn't been some concerted effort to make them off limits to me, to demonize their content. The effort was even more insidious now that I think back about it because what they were really trying to do is get me to censor myself, to passively accept their introjects and their sense of morality and never question it again. The censor would become internal, and I would have believed it was really me, not them. A few weeks into that second semester I was suspended for continuing to bring these books in. I had gone as far as to ask for them from a book club for Christmas, and would share them with anyone who was interested. It has been a lot of fun for me reclaiming these memories from the void, and like the character in The Chronicles of Amber who has amnesia, seeing the books laid out before me in a growing pattern as I remember one after the other. Some of these are most decidedly not literary classics, but I hope you, too, will pick one up and read it, whether the ghost of Edwin Meese likes it or not.